This Munch Non-Stick Cookset is a large set ideal for families and larger groups, with its high quality non-stick interior surfaces it’s like going from home to home and you’re able to cook with the confidence of knowing that your food will not burn and stick to the pan. The product is made from very strong, lightweight aluminium making it extremely easy to transport as well as easy to clean. It comes complete with a handy storage bag making it very compact and easy to store. Each pan has a sturdy, folding cool touch handle to ensure your safety when handling. This is an extremely good cookset for every family or large group. 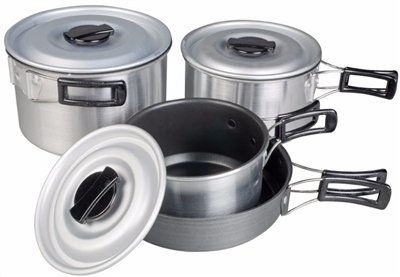 These pans take up no room at all, have good storage bag and are easy to use and sturdy enough for cooking for whole family. non-stick makes washing up a breeze! handles folding away but actually attached is great -much safer than pans with detachable handles. I am really happy it was just what I was looking for. Great for apace saving and super fast service from Campingworld only took few daya to get to Iceland.